California's drought is taking its toll on wildlife. Years of sub-par precipitation have cut the amount of water available for wildlife refuges that supply critical habitat and food for waterfowl and other migratory birds. Reduced river flows are pushing endangered fish species to the brink. Riparian forests have also been impacted by the drought, as well as by groundwater over-pumping. 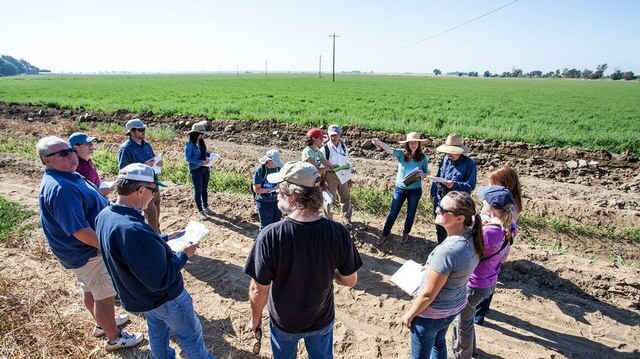 To combat this, the Environmental Defense Fund, along with a partner organization, has launched the Central Valley Habitat Exchange, a voluntary program that gives landowners — farmers and ranchers — incentives to create wildlife habitats on their land. Ann Hayden: The Habitat Exchange program we are developing throughout the country is aimed at creating incentives for farmers and ranchers to create habitat benefits on their land while maintaining agricultural productivity. In a sense, they would be getting paid to grow habitat in the same way they grow crops — it’s an additional commodity they would get paid for. Hayden: It helps to have a driver like the Endangered Species Act because when listed species are impacted it will have to be mitigated, so there will be a need to offset that habitat somehow. We’ve focused largely on a handful of listed species at the state or federal level — Swainson’s hawk, the giant garter snake, Chinook salmon, Monarch butterflies and riparian songbirds, within which there are a couple of listed species. Hayden: We’ve been in development since 2012. We got a U.S. Department of Agriculture conservation innovation grant, which is a three-year grant that helped develop the infrastructure for the program, and flesh out habitat quantification tools — the mechanism to measure the quality of a parcel of land for a particular species. Hayden: Any entity that is interested in either meeting a conservation goal, such as the Delta Conservancy, or meeting a mitigation mandate, such as a water agency that is doing some levee setback projects or a developer that is implementing a project — those projects that would impact habitat for certain species — would be a buyer of habitat credits through the habitat exchange. Hayden: The feedback we’ve received is that there is a lot of interest to participate in an effort like the Habitat Exchange, but so far the barriers of entry into the conservation mitigation market have been so high that it has been difficult to know how they even get there — it’s complicated or costly. So we are trying to lower the barriers of entry for folks in the agricultural community to be part of the market. The idea is to use the tool initially to understand the baseline conditions and then have some sort of agreement to go back after a time to the property and run the habitat quantification tool again to see how the habitat is responding. This is not a tool that involves counting populations of species — it’s really looking at the habitat quality on the landscape. That will tell us how well it can support species. There have been some experiments done through the work of Trout Unlimited and UC Davis where they have determined that juvenile salmon reared in these rice fields during these critical months end up as “big fatties” — they come out stronger and much bigger than juvenile salmon coming down the Sacramento River which don’t have access to the food or protection from predators [as on the flooded rice fields]. Rice farms can simulate what the floodplain used to do before we changed the plumbing so much in the state and redirected water from these floodplains during these critical times.